An Indonesian court sentenced the minority Christian governor of Jakarta to two years in prison on Tuesday for blaspheming the Quran, a jarring ruling that undermines the reputation of the world’s largest Muslim nation for practicing a moderate form of Islam. In announcing its decision, the five-judge panel said Gov. Basuki “Ahok” Tjahaja Purnama was “convincingly proven guilty of blasphemy” and ordered his arrest. He was taken to Cipinang Prison in east Jakarta. At the court, supporters of the governor wept and hugged each other amid shouts of jubilation from members of conservative Islamic groups. Photos quickly appeared online of Ahok, who still commands immense popularity in Jakarta, the capital, being warmly greeted by prison staff. Ahok said he would appeal, but it was unclear if he would be released once that process is underway. By early evening, hundreds of angry supporters had gathered at the high-security prison, some pushing hard against a tall metal gate and others setting a tire alight. “Brothers and sisters, justice has died in this country,” said a man addressing the crowd with a megaphone. 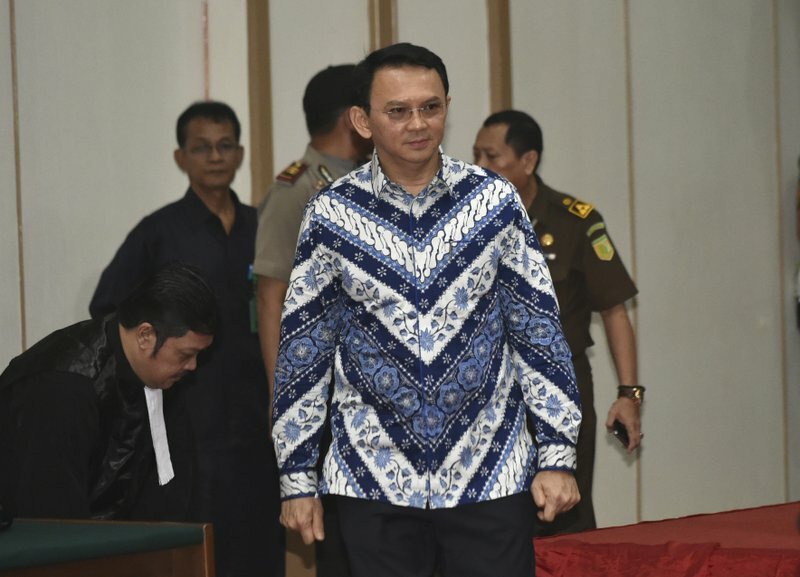 The accusation of blasphemy engulfed Ahok in September after a video surfaced of him telling voters they were being deceived if they believed a specific verse in the Quran prohibited Muslims from voting for a non-Muslim leader. Massive street protests in the past six months against Ahok and Tuesday’s verdict are among the signs of an increasing religious conservatism in Indonesia. In Western capitals, the country has traditionally been seen as a bulwark of tolerance and pluralism in the Islamic world. Vigilante groups frequently attempt with impunity to prevent Indonesia’s religious minorities from practicing their faiths, and the country’s gay community has faced a surge in persecution in the past two years. The blasphemy case was a decisive factor in Ahok’s defeat to a Muslim candidate in last month’s election for Jakarta governor. 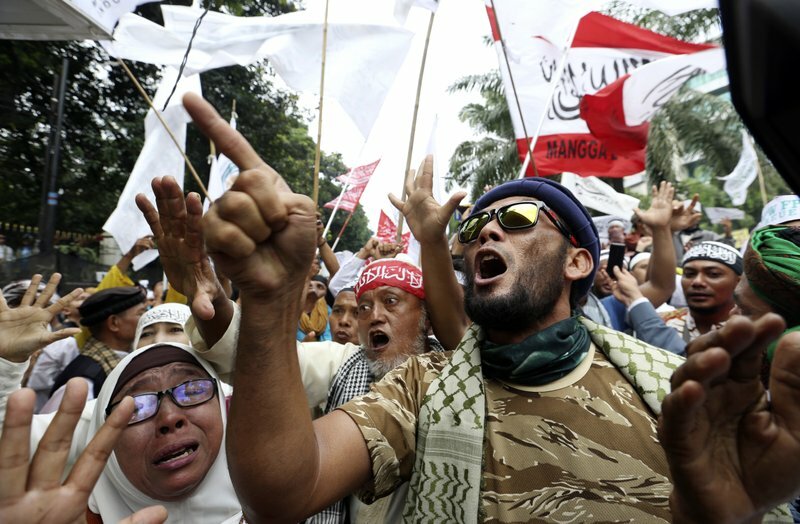 Hard-line Islamic groups opposed to having a non-Muslim leader for the city capitalized on the trial to draw hundreds of thousands to anti-Ahok protests in Jakarta that shook the centrist government of President Joko “Jokowi” Widodo. 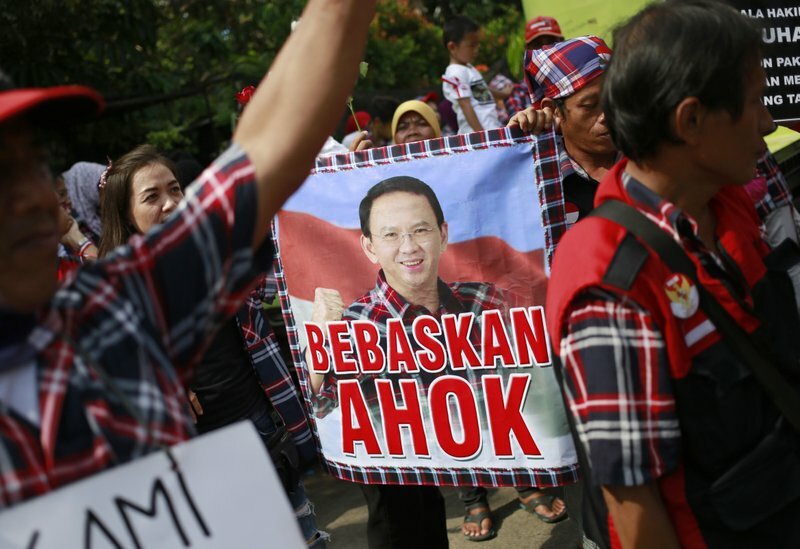 “Hard-liners will feel emboldened by the ruling, given that the trial represents a wider tussle between pluralism and Islamism in Indonesia,” said Hugo Brennan, an analyst at Verisk Maplecroft, a political risk assessment firm in Singapore. Outside the court, Syamsu Hilal, a member of a hard-line Muslim group who reported Ahok to police last year, said justice had been upheld. “Here we have witnessed that the judge has become a representative of God,” he said. The sentence was also welcomed by the youth arm of Muhammadiyah, Indonesia’s second-largest mainstream Muslim organization. But Ahok supporter Adrian Sianturi said the trial was a victory for intolerance and corruption. “This decision is the character assassination of a good governor, a clean politician who is rare in this country,” he said. The two-year prison sentence was a surprise outcome after prosecutors had recommended two years of probation. 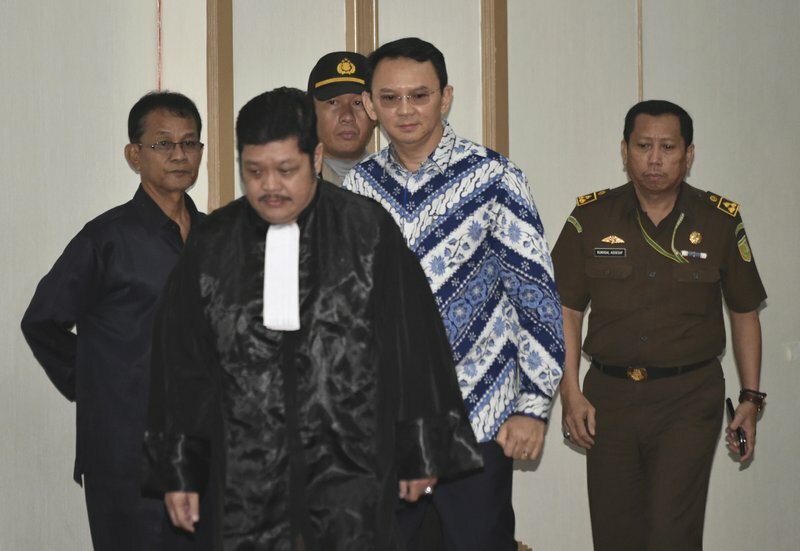 The maximum sentence for blasphemy in Indonesia is five years in prison. 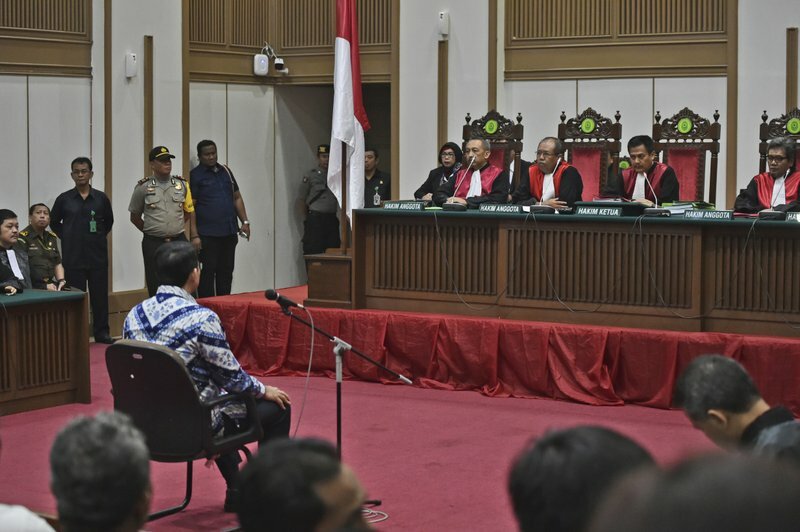 The lead judge, Dwiarso Budi Santiarto, said the trial was a purely criminal one and that the court disagreed that there were political aspects to the case. He said Ahok’s comments during the election campaign had degraded and insulted Islam. “As part of a religious society, the defendant should be careful to not use words with negative connotations regarding the symbols of religions including the religion of the defendant himself,” he said. Wayan Sudirta, a lawyer for Ahok, said there was “so much pressure” for Ahok to be imprisoned. “We can understand but we cannot accept the verdict. Therefore we will appeal,” he said. 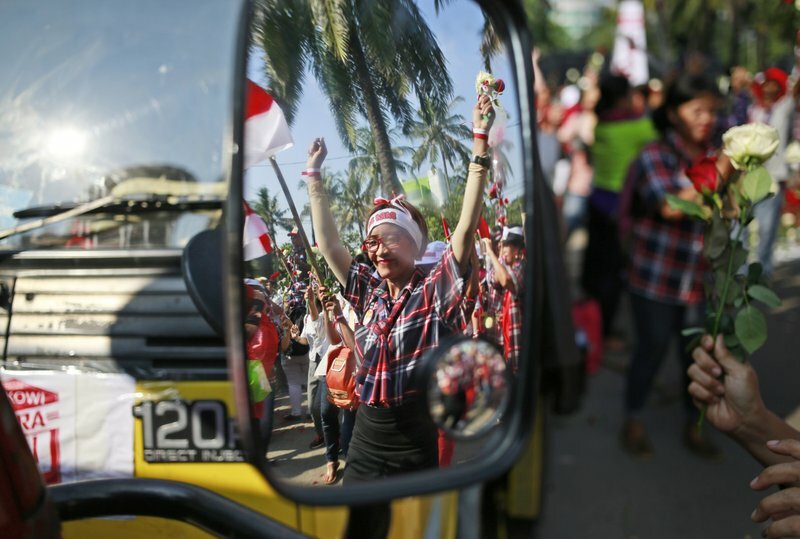 Ahok rose from deputy governor in 2014 after Jokowi vacated the capital’s governorship following his victory in Indonesia’s presidential election that year. He was popular with Jakarta’s middle class for efforts to stamp out corruption and make the teeming city more livable. But others were alienated by Ahok’s outspokenness and the demolition of slums that were home to Jakarta’s poorest residents. 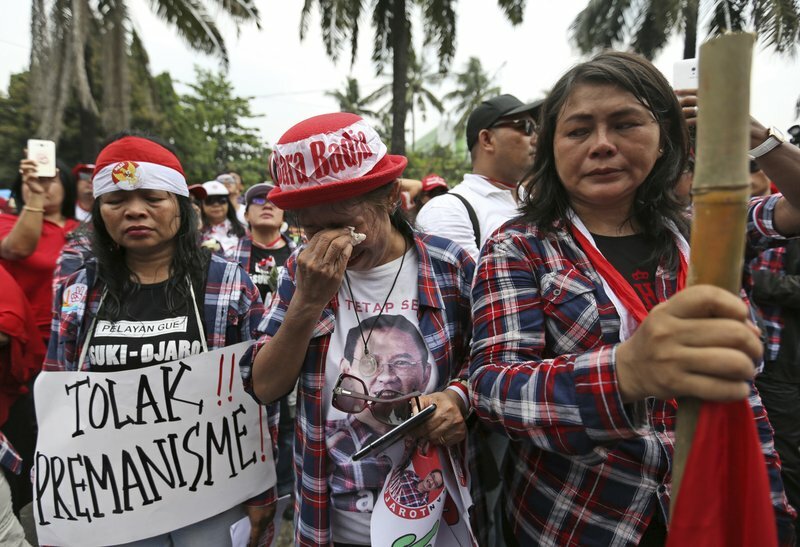 Supporters of Jakarta Governor Basuki “Ahok” Tjahaja Purnama react to the judges’ verdict outside the court where his sentencing hearing is held in Jakarta, Indonesia, Tuesday, May 9, 2017. The court on Tuesday sentenced the minority Christian governor of Jakarta to two years in prison for blaspheming the Quran, a shock decision that undermines the country’s reputation for practicing a moderate form of Islam. 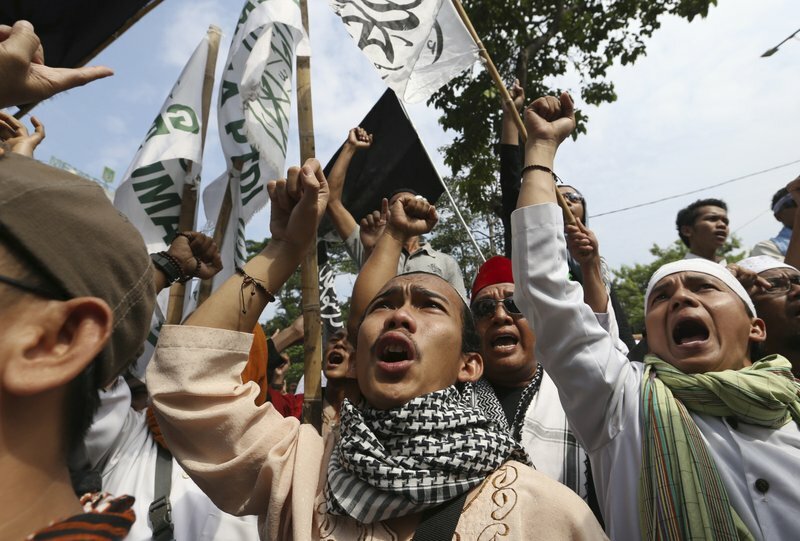 Muslim protesters shout slogans during a protest against Jakarta’s Christian Governor Basuki “Ahok” Tjahaja Purnama outside a court where his trial is held in Jakarta, Indonesia, Tuesday, May 9, 2017. An Indonesian court on Tuesday sentenced the minority Christian governor of Jakarta to two years in prison for blaspheming the Quran, a shock decision that undermines the country’s reputation for practicing a moderate form of Islam. Jakarta Governor Basuki “Ahok” Tjahaja Purnama sits on the defendant’s chair as he attends his sentencing hearing in Jakarta, Indonesia, Tuesday, May 9, 2017. The minority Christian governor is currently on trial on accusation of blasphemy following his remark about a passage in the Quran that could be interpreted as prohibiting Muslims from accepting non-Muslims as leaders. Supporters of Jakarta Governor Basuki “Ahok” Tjahaja Purnama display balloons during a rally outside the court where his sentencing hearing is held in Jakarta, Indonesia, Tuesday, May 9, 2017. The minority Christian governor is currently on trial on accusation of blasphemy following his remark about a passage in the Quran that could be interpreted as prohibiting Muslims from accepting non-Muslims as leaders. 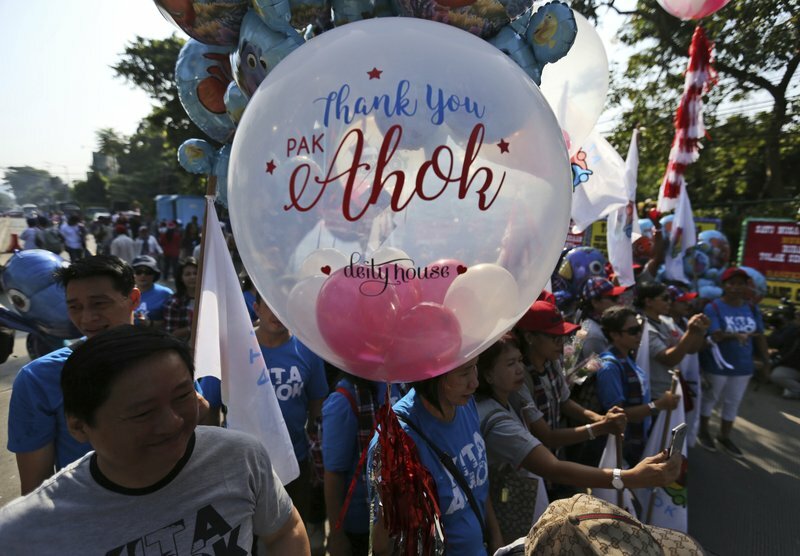 Supporters of Jakarta Governor Basuki “Ahok” Tjahaja Purnama display a poster that reads “Free Ahok” during a rally outside the court where his sentencing hearing is held in Jakarta, Indonesia, Tuesday, May 9, 2017. The minority Christian governor is currently on trial on accusation of blasphemy following his remark about a passage in the Quran that could be interpreted as prohibiting Muslims from accepting non-Muslims as leaders. A supporter of Jakarta Governor Basuki “Ahok” Tjahaja Purnama dances as her reflection is seen on the mirror of a truck parked outside the court where his sentencing hearing is held in Jakarta, Indonesia, Tuesday, May 9, 2017. The minority Christian governor is currently on trial on accusation of blasphemy following his remark about a passage in the Quran that could be interpreted as prohibiting Muslims from accepting non-Muslims as leaders. 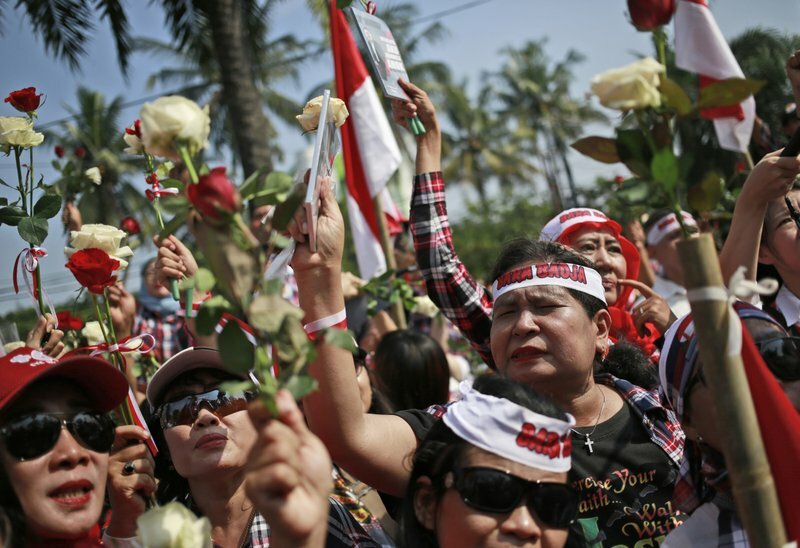 Supporters of Jakarta Governor Basuki “Ahok” Tjahaja Purnama hold flowers during a rally outside the court where his sentencing hearing is held in Jakarta, Indonesia, Tuesday, May 9, 2017. The minority Christian governor is currently on trial on accusation of blasphemy following his remark about a passage in the Quran that could be interpreted as prohibiting Muslims from accepting non-Muslims as leaders.